An unconventional and inventive coming-of-age memoir organized around fifty-one remarkable poems by poets such as Robert Frost, Emily Dickinson, Wallace Stevens and Sylvia Plath, from a critically acclaimed New York Times bestselling author and poet. While Bialosky’s personal stories animate each poem, they touch on many universal experiences, from the awkwardness of girlhood, to crises of faith and identity, from braving a new life in a foreign city to enduring the loss of a loved one, from becoming a parent to growing creatively as a poet and artist. 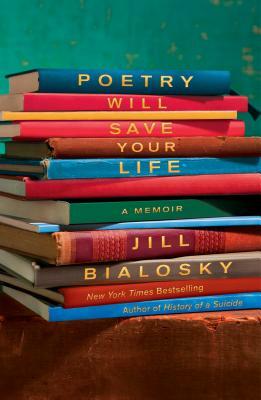 In Poetry Will Save Your Life, Bialosky has crafted an engaging and entirely original examination of a life while celebrating the enduring value of poetry, not as a purely cerebral activity, but as a means of conveying personal experience and as a source of comfort and intimacy. In doing so she brilliantly illustrates the ways in which poetry can be an integral part of life itself and can, in fact, save your life. "An intimate rendering of a poet's passion for words." "Time and again she proves her thesis of survival through the arts. But it is not a work of an essayist but one of a person who believes in the power of art to connect us in our shared humanity." "Jill Bialosky writes with a sincerity that would have made Dickinson herself weep. She fights to keep poetry from being lofty and academic, she takes it out of the clouds and brings down to earth. Having an expert guide you to a subject with the humility and enthusiasm of a beginner is as moving as her prose in which she reminds us that she has also been a woman who needed saving, and poetry swept in and gave her back a pulse. She achieves something remarkable in that it feels as though she is revealing herself for our sake, the readers: basically what all the best poetry strives for." "Bialosky's attention to detail and love of language serve the reader well. This is a book to savor."